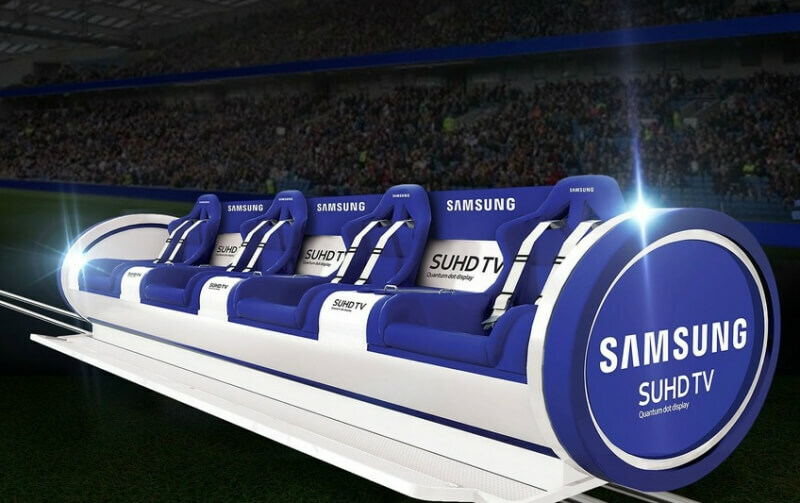 Samsung is bringing a new meaning to the term “best seats in the house.” Forget about the pampered luxury of stadium skyboxes; this new sliding bench will keep you next to the action at all times, no matter where it’s happening. The device, which is appropriately called the Slider, moves up and down the field on a custom track so that spectators are kept as close to the game as possible. The Slider will be installed at London’s Twickenham Stadium later this month. The four-seater bench, which features a “revolutionary aluminum design,” will run along an 80 meter (262 foot) track at speeds of up to 20 mph. The sliding bench will only be available during the two-day London Sevens (a seven-a-side version of rugby) World Series tournament that takes place on the 21st and 22nd of May. There will be 180 rides offered across the 45 match schedule. The obvious issue with the Slider is that rapidly moving back and forth could cause motion sickness, and eating or drinking while on the bench would no doubt pose problems. With Rugby Sevens, however, each half lasts seven minutes. As each person only gets to ‘ride’ the bench for few minutes, it shouldn’t be long enough for them to start feeling nauseated. Samsung is giving away tickets in a prize draw to UK residents who have purchased one of the company’s TVs, speakers, or soundbars this year. Winners will get a day at the sporting event and one match ride on the Slider. We’ll just have to wait and see if Samsung decides to try out the Slider at other sporting events across the world.